The Denver Performing Arts Complex is the largest performing arts center under one roof in the country. Connected by an 80-foot-tall glass roof, the Arts Complex houses ten performance spaces on its four-block, 12-acre site, including the historic Ellie Caulkins Opera House, the Buell Theatre and Boettcher Concert Hall, each with their own charm and character. 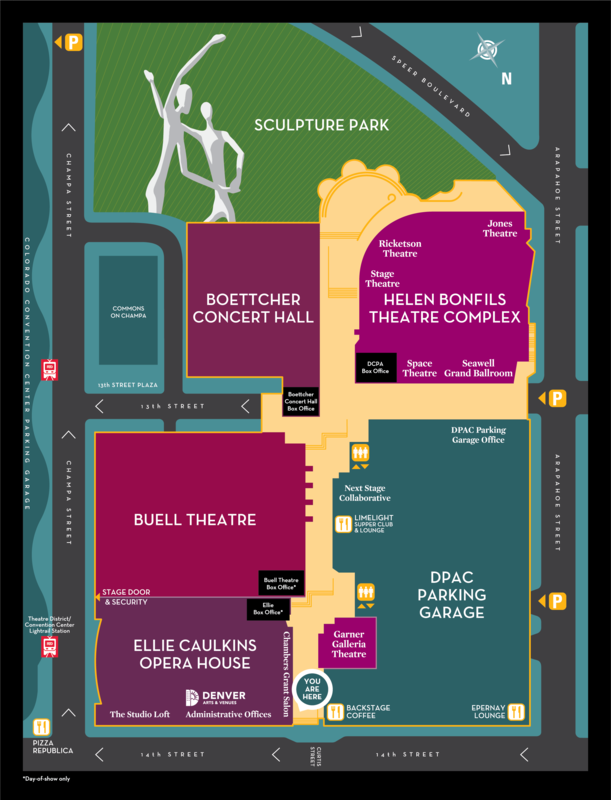 The Arts Complex is home to four signature resident companies: Colorado Ballet, Colorado Symphony, Opera Colorado and the Denver Center for the Performing Arts which offers Broadway shows, Tony-winning theatre, cabaret and experimental productions. The Denver Performing Arts Complex is a vibrant regional cultural hub in downtown Denver. In accordance with our agency’s mission and through management excellence of premier public venues and active public spaces, the Arts Complex will elevate the fine performing arts, offer shared cultural experiences, welcome the community to enjoy a diverse range of activities, and enhance the downtown experience.